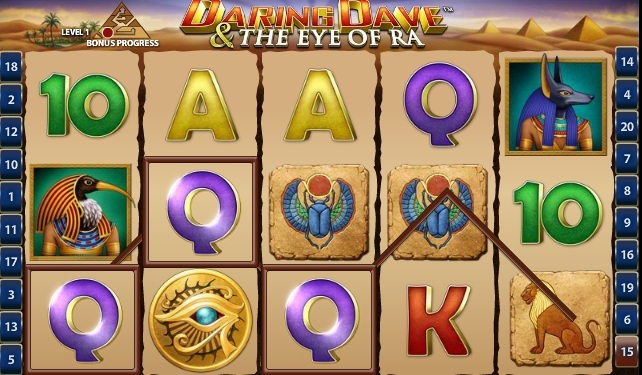 Daring Dave & The Eye of Ra is a thrilling archaeological adventure slots from Playtech. Featuring 20 paylines, 5 reels and three bonus levels this game will transport you back to the ancient Egypt as you adventure with Dave through the pyramids. The quest has three levels each with its own adventure; complete each level to progress to the next and move one step closer to the Eye of Ra. The first level presents you with 8 stones, each stone is a cash prize and three of them will reveal the Eye of Ra symbol, if you find them all you will then advance to the next level. Level 2 contains an ancient wheel, you can spin the wheel three times and at the end of each spin you will win the total prize of the three pointers. Each time a pointer lands on the Eye of Ra symbol the pointer is lit, light three of them to reach level 3. Level three contains a huge statue of Ra, there are three pedestals and you need to choose the correct one to find the Eye of Ra. 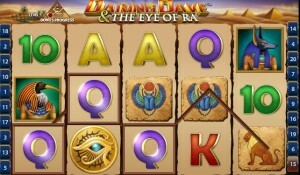 Each pedestal contains a cash prize and if you find the Eye of Ra you will win 75x your bet. Any adventure enthusiasts are sure to love this Playtech slot. You can read more about Daring Dave and his adventures by visiting http://www.DaringDaveandtheEyeofRa.com.